Handmade rugs make a luxurious addition to any room they’re placed in. For those who are not familiar with these high-quality rugs, it can be easy to mistake a machine-made rug for a handmade one. But there is a great difference between the two when it comes to quality and price. It’s important to make an informed decision when you purchase any handmade rugs, whether you buy them from a local retailer, vendor, or an online store. There are specific features that can help you tell spot an authentic handmade rug so that you don’t end up paying a fortune on a rug that isn’t worth it. Should You Purchase a Handmade Rug? Hand knotted rugs have specific parts that allow you to recognize them right away. They are made on a special loom and knotted by hand. Making a handmade rug is an ancient practice that dates back for hundreds of years. 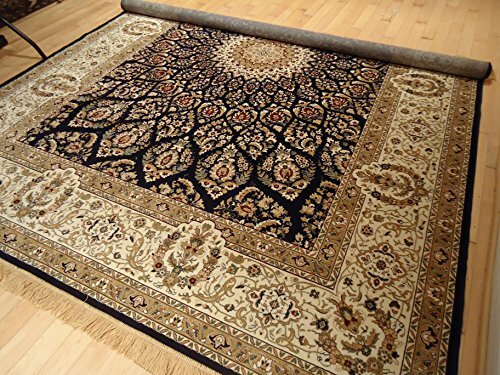 Before you buy a handmade rug, it’s important that you know what this type of product is. Hand knotted rugs are the very best you can buy when it comes to rugs and carpets. Handmade rugs can be made from wool, silk, jute, cotton and other natural materials. It’s not common for these rugs to be made from synthetic or poor-quality materials. They are designed to last for generations and are often kept as collectible pieces. The quality of a hand-woven rug depends on a few factors such as the dye that is used, the knot count, and the quality of the yarn. Handmade Rugs are known by several different names. They can be called oriental rugs or hand knotted. There are also multiple categories of these high-quality rugs, including flat weave and hand woven. Hand tufted rugs are not the same as handmade rugs. 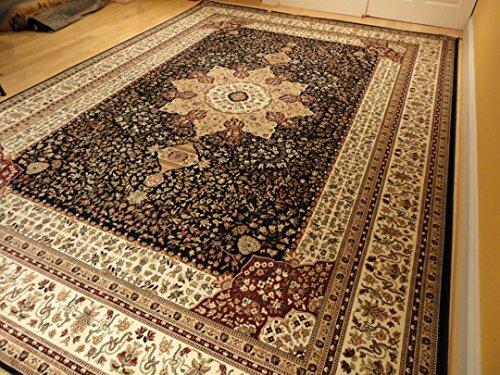 These may feature the same elegant look of a handmade rug; however, they are more affordable since the crafting process doesn’t take as long. These rugs are made using a hand-held drill gun that helps to speed up the weaving process. While they can make a beautiful addition to your home, hand tufted rugs are usually not made with the same fine materials and aren’t considered a worthwhile investment. A good rule to remember when shopping for hand woven rugs is to look at the back. A hand knotted rug will feature knots that are slightly uneven and not perfect. However, rugs made by a machine will have a uniform appearance with minimal if any mistakes. Remember that the more detail you can see when looking at the back of the rug, the better the overall quality of the rug. Another way to determine if the rug is hand woven or made by a machine is to look at the fringes. The fringes on a machine-made rug are sewn on at the end of the rug making process. Those that are on a handmade rug are an extension of the rug’s foundation. Handmade rugs are made using a loom with warp strings at the top. These vertical threads are tied onto the loom and are the starting point for making the rug. They will eventually become the rug’s fringe. The weft string runs horizontally through the loom and is woven with the vertical threads. The size of the loom used to create the rug depends on the size of rug the person is making. Weaving is done from the bottom to the top. The weaver inserts the knots into the foundation, which will appear asymmetric on Senneh or Persian rugs. All knots are securely tied by hand. 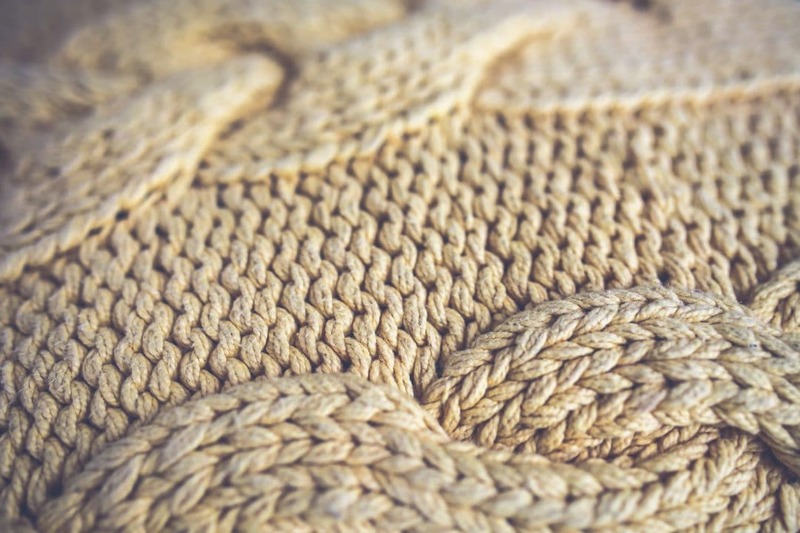 The tying of the knots creates the nap or pile of the rug. The process can be very time consuming, yet the result is something that is truly unique and beautiful. All hand knotted rugs are made by a single weaver. The weaver ties each knot individually to create a one-of-a-kind design. Knots are tied to the warp threads, then cut and tied again to secure each knot. A weaver with years of experience making rugs can tie a knot once every two seconds. Handmade rugs can be a great investment that are timeless and may be passed from one generation to the next. Since they take so long to make, and they are made to last a very long time, these rugs can sometimes cost a small fortune. The most expensive handmade rug ever sold at auction was a Persian Vase Carpet. This antique rug from the 17th century sold for a record-breaking $34 million. The rug was sold at Sotheby’s Auction in New York City. It more than tripled the cost of the previous most expensive rug. The Persian Vase features intricate detail and beautiful colors that make it a true work of art. This rug features a sickle-leaf vine scroll and palmette vase technique in its design. It is believed that the rug is of Kerman origin and once belonged to the Clark Collection. While most handmade rugs are very expensive, there are some worth mentioning as the most expensive in the world. Aside from the Persian Vase Carpet rug mentioned above, there are several more that have shattered records and made some lucky rug collectors very happy. Material: Silk; 230L/ 367kpsi/ 569,410 knots/sq.m. The previous owner of the title of the most expensive rug in the world was the Silk Isfahan Rug. It measured 7 ft. x 7 in. x 5 ft. x 7 in. and was sold by Christie’s in 2008 for $4,450,000. The rug features a high knot density, the use of multiple colors, and amazing craftmanship. It was also made using pure silk material which helped to contribute to its value. 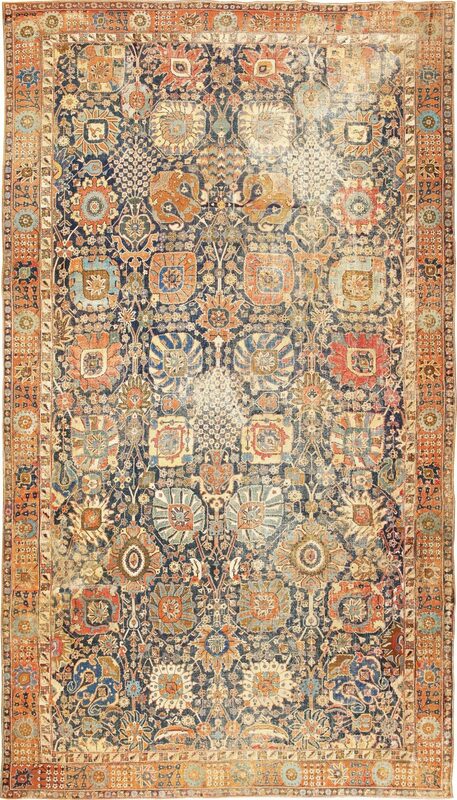 This rug which originated from Central Persia sold for $182,500. The rug was in excellent condition at the time of sale which contributed to its price. It has a remarkable palette of colors including terracotta and varying blues. The Ziegler Mahal rug measures 11’ 10” x 8’ 10”. Another Ziegler Mahal creation makes the list of the most expensive rugs in the world. This rug measures 10'x8'. It is worth so much because of its size and soothing neutral tones. This particular rug had some damage yet was still considered an extremely valuable piece. The Ushak Rug which measures 4’ 6”. It features a beautiful brick red tone and amazing craftmanship that would make a grand addition to any home. The Ushak Rug which measures 4’ 10” x 3’ x 11” sold for $158,500. It features a beautiful brick red tone and amazing craftThe fifth most expensive rug in the world is the Ishfahan Rug. This piece was part of the Doris Duke collection and sold for a price of $116,500. 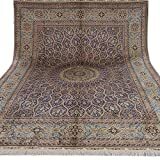 The features that helped it gain such an expensive price tag include the overall value of the rug, impressive colors, intricate pattern design and the decorative value. It measures 16’ 1” x 6’ 11”.manship that would make a grand addition to any home. A nice area rug can help to improve the look and feel of any room that its placed in. It can upgrade the look of your old flooring and add elegance to your home décor. Area rugs are available in many different designs, colors, patterns and materials. They are all sizes and shapes and can be either handmade or machine-made. There are many reasons to invest in a good quality area rug. Sometimes homeowners want to accent a new piece of furniture or they want to add an extra layer of warmth to their hardwood flooring. Area rugs can even be used to hide an unsightly stain or worn-down area of carpet. The important thing to remember when shopping for a new area rug is if you want a high-quality rug, you will have to pay the price. Although handmade rugs are a great investment, if you are simply looking for something to spruce up your home or add warmth to your flooring, a designer machine-made rug can be a great, affordable option. There are several different types of area rug designs available. Whether you choose one that is handmade, or opt for one that is machine made, a nice designer rug can make a huge difference in the room its placed in. Here are some of the different types of rugs to choose from. A flatweave is a low-maintenance rug that has no pile. This means that the fibers or yarn used to make the rug do not extend vertically from the base. Since there is no pile, a flatweave rug is not as soft or cushiony. However, it will not collect as much dust and dirt as one with a low or high pile. It doesn’t require any special care and is often very easy to clean. Some flatweave rugs are even machine washable which can be a great benefit if your flooring is prone to heavy traffic. The flat profile of these rugs can make it easy for you to slip, so adding a pad underneath to prevent accidents is a good idea. A low-pile rug is a good choice if you are looking for something that is comfortable yet generally easy to care for. These rugs feature fibers and yarn that extend upward from the base at an average of a quarter inch. A low-pile rug is softer than a flatweave, and easier to care for than a high-pile area rug. For those reasons, low-pile rugs are often used in commercial settings such as office buildings or schools. Some homeowners do not like using them for residential purposes. However, there are many interesting styles and designs available in low-pile rugs which make them a great choice for those who want something different for their home décor. High-pile area rugs are the most comfortable, soft and plush type available, but they are also the hardest to clean and care for. These rugs were made popular in the 70’s when shag carpets where all the rage. While high-pile rugs are made of better quality materials than they were in the past, many people still feel that they are too much of a hassle to deal with, even if they feel amazing on your feet. If you do choose a high-pile rug, you should place it in an area with low traffic to cut down on the wear and tear. A good quality area rug will last for years to come. So be sure to think about that when you start to look for a handmade rug for your home. Here are a few things to consider when looking for a new rug. Handmade rugs offer plenty of original designs and patterns for you to choose from. If you want to enhance any area of your home or a particular room, an elegant hand-woven rug is a great way to do just that. If your have a room with a lot of things going on, a solid colored area rug can help tone down the chaos and add more warmth to any space. When you choose the right handmade rug for your home, it can instantly change the mood of the room its placed in. Fun patterns and vibrant colors will add spice to a room that may have a boring or standard décor. Darker tones will make a room feel cozier and inviting, while buying a rug with lighter tones will cause your room to look and feel larger than it is. Does the layout of your living room feel disjointed or out of place? When you have the right rug, it can pull all your furniture together and made the room appear more complete. When you have an area rug that is soft and has a bit of cushioning, it can make standing on a tile or hardwood floor comfortable. Laying on an area rug feels much better than a cold hardwood floor. And there are some area rugs that have a softer texture than others depending on the material used. A high-quality antique handmade rug can be a grand addition to your home, but they aren’t for everyone. These elegant pieces are true works of art and should be considered an investment instead if a piece of furnishing. If you have small children, pets inside the home, or are simply accident-prone, you may want to go with a more affordable option for an area rug. No one wants to pay thousands for a handmade piece only to have it destroyed. Choose your new area rug wisely and be sure to pick one that enhances your home in the way you desire.